How cool would these be peeking out of your bathtub? 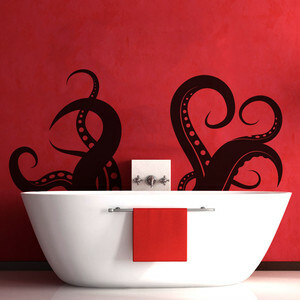 These tentacle wall decals come in a variety of sizes, so they can come out of your sink, tub, shower, or anywhere else you may want. Tentacles not your thing? StickerBrand has a variety of options including tree branches, pirate ships, the Brooklyn Bridge, and the moon. StickerBrand is available on Fab.com for a limited time, so grab them while you can get the discount!